“Yes, I am just leaving the office. Will drop in at Krishna Sweets on the way home and get the sweets… Alright, 1kg Mysore Pak.” I cut the call and start walking towards the bus stop. It feels different to be out on the road at this hour of the day, on a working day. It has been long since I left for home at 4 in the afternoon, probably never. Today, however, is a special occasion. I adjust my dupatta and tuck my hand bag firmly between my body and right hand as I reach the bus stop, getting ready for the adventure lying ahead of me. Getting into a 17D on a weekday is no mean task, even if it is not yet rush hour. 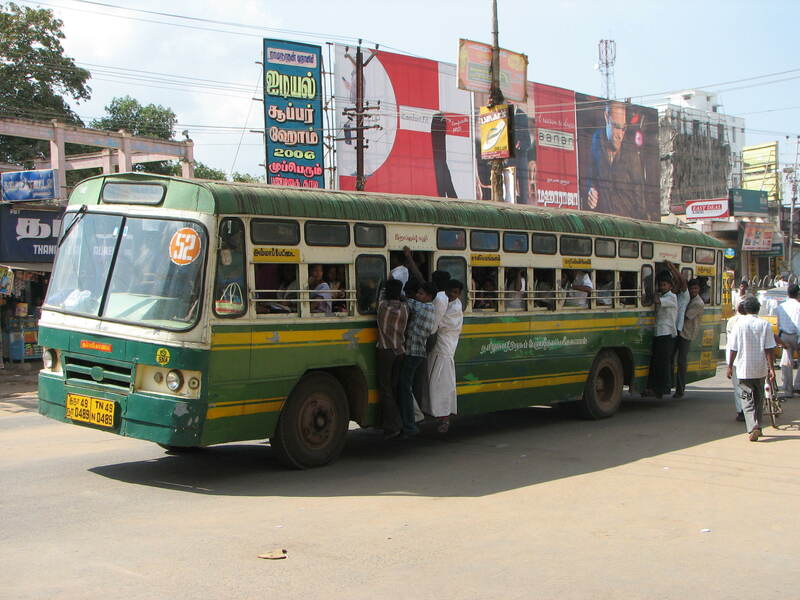 The bus runs along one of the longest routes that MTC has, and is almost always more than fifty percent full. Having traveled on this route for over 2 years now, though, I am beginning to master the art of travelling on MTC buses without getting flustered by all the jostling. The mood in which I reach home every evening depends on how my ride back home passes. Most days I do not get a place to sit. That is ok, given that I travel between Egmore and Kodambakkam, both amongst the busiest localities the bus passes through, and I have given up hoping for a seat. My ride is usually pleasant if I am able to attach myself to a pole near the ladies section of the bus, balancing myself on the pole by the shoulders and thus having my hands free to change radio stations on my phone. I don’t mind other passengers pressing upon me, as long as they are women. It becomes irksome when the bus is too full for me to find a place to stand near the seats, and I end up sandwiched between two passengers, hanging from the pole overhead. And in that, if one passenger is a male, then I am done for. I become so sensitive, that I lean more towards the female side of the sandwich, ignoring the lady’s grunts of disapproval. I can tolerate those, but not the grinding and the squeezing and feeling and what not, that happens behind me. A slightest touch of anything, has me twitching this way and that, and I cannot rest in peace until I have found a more comfortable position, maybe an all female sandwich. That however does not mean I am always successful in completing the bus ride without being violated. I have had my share of buttock squeezes, wet grindings (knowing something wrong is happening, but too afraid and disgusted to turn around and face the pimp), fingers grazing my thighs and trying to pry between them. Of late, however, I have been successful in avoiding such ‘incidents’ on most days. I see the ordinary 17D, the one that halts at all the stops and is usually the rickety, old and ill kept cousin of the plush AC versions that have begun to ply, lazily rolling towards me, inclined on one side. Usually I would have waited for a deluxe bus at least to arrive, if not the AC version, but today I am in a hurry. Pushing away the thoughts of the misdemeanors of jobless and shameless men, I board the bus. Today it is very important that I retain my good mood. The boy coming to see me seems decent enough. Good salary, own house, and good looks apart, he sounded cordial and well mannered in the couple of messenger chats I had with him. If this match materializes, Appa and Amma will be so happy. I find a comfortable pole and congratulate myself for it. As the bus speeds towards Nungambakkam, but elation slowly starts to turn into trepidation. It is school closing time, and loads of salwar uniform clad girls from the Nungambakkam Girls Higher Secondary School and the one in Valluvarkottam start filling up the bus. I cling tighter to the pole, hoping I would not have to relinquish my position for a younger and more vulnerable specimen from my species. My fears come true though, when a small girl, reaching just upto my shoulders, hair plaited and twisted into a U and held in place by white ribbons, with Kanakambaram flowers hanging from one side, starts showing signs of discomfort, and begins encroaching my space. I don’t have the heart to not give that girl space, and in a moment of weakness, find myself sandwiched to a man in his sixties behind me. It might still be ok, I hope. After all, he is my father’s age. I am wrong. I soon feel something pressing hard on my buttocks, and grinding fervently. I feel him breathing fast, as though with excitement, and soon, a wide palm cups my buttocks and squeezes it hard. Thats it. Not today, of all days. I bring out my water bottle from the bag, and using the blunt end, punch him between the legs. “Ahhh” I hear him crying in agony behind me. “Enna achu ayya?” People around him inquire what happened, with concern. I smirk at ‘Ayya’, a word used in deference for wizened old men. I inch forward and park myself between two women, who readily accomodate me, guessing quietly what just transpired. I am trembling all over, and sweat buds have formed on my forehead. The girl to whom I relinquished my earlier position gives me her bottle to drink. There is a look of gratitude in her face. I empty her bottle in big gulps, yet, the dirty feeling refuses to go. Tears well up, and once again, I curse the God for making me a girl. When I get down at Kodambakkam, my anger has subsided a bit, but the agony refuses to go. I discreetly move my hand over the suit over the buttocks to find a wet patch there. I immediately want to puke. At home everyone is busy with the arrangements. I go quietly into my room and slip into the bathroom. There I stand for more than 15 minutes, splashing huge mugs of water on my face and scrubbing and scrubbing my body till the skin becomes red. Only when Amma comes and knocks the door the second time, do I reach for the towel and wipe myself. Soon I am draped in a saree, my favorite from Amma’s Kanjeevaram collection. That cheers me up a bit, and when Pawan brings me a small cricket ball sized roll of jasmine strand, my mood changes for the better. I start to smile again, and my mother’s face shows a sense of relief. Soon everything is set, and everyone is waiting for the bridegroom party to arrive. I sit inside my room, waiting to get called for, so that I can take the tray of sojji and bajji from the kitchen and serve the visitors. And in that process, steal a glance at the man I am being paired with. Yet, strains of conversation waft in through the half opened door. “We are a very orthodox family,” an authoritative female voice is saying, presumably my future mother in law. “My husband does Sandhya Vandanam three times a day, and never misses the daily pooja. We never touch anything in the kitchen without taking bath. Your daughter knows about all the acharam anushtanam, no? We don’t allow our women to wear jeans or other western clothes. 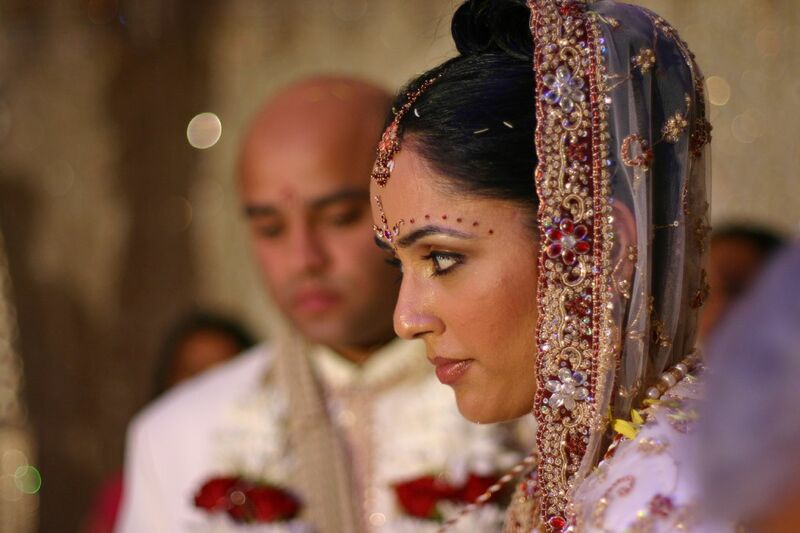 Only salwar kameez is ok…” I quell the sinking feeling inside me with the thought that anyway I will fly away with my future husband to the US, where he lives and works. Soon, my turn comes. Pawan hands me the tray of sweets and savories, and I slowly walk towards the people sitting in the drawing room, with my eyes firmly on the ground, as instructed by my mother. I serve the plates one by one, not once looking up at anyone else. When I come to the boy, I ever so slightly lift my eyes to see his face. He gives me a small smile, and blood rushes into my cheeks. Handing the now empty tray to Pawan, I bend down to prostate in front of everyone, again, as Amma told. But, suddenly there is a commotion. The man supposed to be my father-in-law seems to be choking. My Appa converges on him and asks him to drink water, and inquires anxiously whether he should call a doctor. It is only then I see the man’s face, and in an instant, I know what made him choke. Fortunately, the dirty old man’s true colours were known in time. In many cases, such men maintain their “God-fearing”, orthodox image very well in public, but show their real selves in private. Unfortunately, when such incidents occur in a public place, the public tend to sympathise with the “poor old man”, especially if the girl is dressed in Western clothes. good narration. enjoyed reading it..thanks yamini! Good Ending.. Although when you said future father in law it irked me somewhere.. I believe a story should do that! First of all, I have had a very long association with 17D. So there’s an extra reason for me to like the story more. Very creatively done and quite a twist too. Well done, Yamini. That bus seems to have touched a lot of lives isn’t it? 😀 Thanks Sid. I kept wondering, if the twist was unexpected enough.